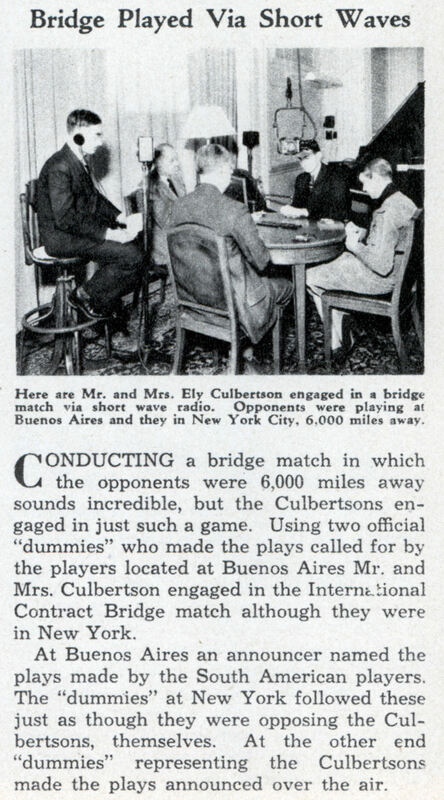 CONDUCTING a bridge match in which the opponents were 6,000 miles away sounds incredible, but the Culbertsons engaged in just such a game. Using two official “dummies” who made the plays called for by the players located at Buenos Aires Mr. and Mrs. Culbertson engaged in the International Contract Bridge match although they were in New York. At Buenos Aires an announcer named the plays made by the South American players. The “dummies” at New York followed these just as though they were opposing the Culbertsons, themselves. At the other end “dummies” representing the Culbertsons made the plays announced over the air.